After a marvelous lunch we visited the Roman city of Jerash which is mentioned in the Bible under the name Gerasa. I talked about Jesus’ relationship with the city as one of the Decapolis which was even in the readings at Mass today. How amazing we were there for these readings! From there we went to that Jabbok River where Jacob wrestled with the angel (to hear Steve’s whole talk at this river that he gave last year, click here) and then gave people some free time this afternoon to recuperate, have a great meal and to bed early for an exciting day tomorrow including driving south to Petra. Always great to visit these biblical sites in Jordan. 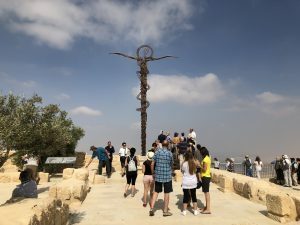 We started the day with Mass at Mount Nebo where Moses looked out over the Promised Land and died. Father Gavin gave another excellent family which you can listen to here. I gave my talk there at the end of Moses’ life which you can see/watch here. 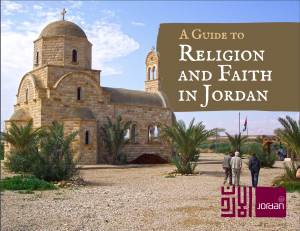 We spent a good bit of time in Madaba which you see in the movie including an authentic Jordanian lunch and the famous mosaic map of the Holy Land. We also went to a mosaic factory and learned all the history of ancient Christian mosaics and how they were made. On our drive down to Petra we stopped at at Herod’s Fortress where John the Baptist was arrested and beheaded. I gave my talk there on the end of John‘s life. Then as the sun was setting over the beautiful mountains we arrived in Petra. One of the Seven Wonders of the World and a site related to biblical history with both Moses and St. Paul, today we toured Petra! This is one of those sites that seems to be on everyone’s Bucket List. 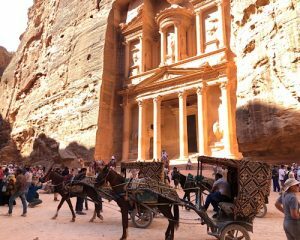 We left our beautiful Marriott Hotel and entered the massive and colorful sandstone corridors leading up to the great Treasury and the city carved into rock. Some of our folks rode camels and horses and we had a marvelous time. We drove north again through the deserts of Jordan and came to Our Lady of Peace Catholic Church, where we had Mass in a church I consider one of my top five most beautiful churches because of the murals and paintings. You’ll see them in the video. You can enjoy another great homily by Fr. Gavin Badway here. We spent the night in Madaba. We left Madaba Jordan and went down to the lowest place on the face of the earth for a Mass on the shore of the Jordan River where Jesus was baptized. For Fr. Gavin‘s family, click here. 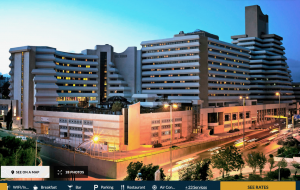 We spent the morning learning and investigating the site and then drove north along the Jordan River and crossed into Israel and arrived at our hotel in Tiberias Israel. Call Elizabeth, Kendall or Lizzie at ‭(866) 468-1420‬ for pricing, more information and help with registration. ** Click on audio button bottom right for sound. 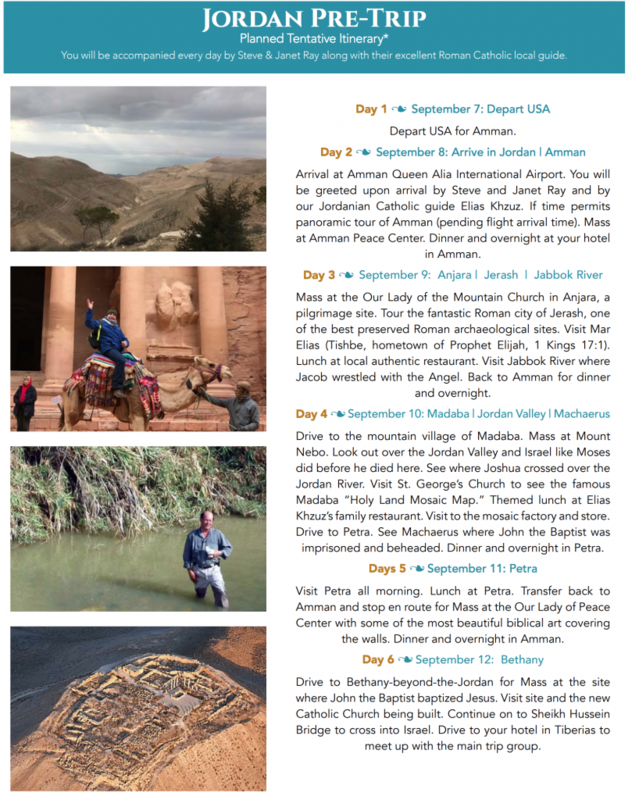 Below you can watch the 1 hour video from our 2017 Jordan pilgrimage below. 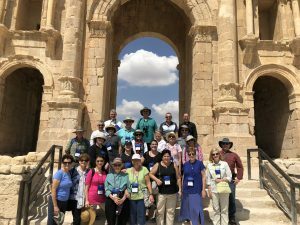 Above: Jordan Pilgrimage February 2018 from Steve Ray on Vimeo. See Holy Land main trip here.